During their epic westward journey in the early 1800’s across the then “wilds” of North America, Lewis and Clark were told of a bear so large and fierce that the Indians gave it a wide berth. The explorers response was “but we have Kentucky Longrifles”, implying that such fire power would defray any attacks. They were soon to find that the Grizzly (Ursus horribilis) definitely lived up to its “fear inspiring” reputation. After several encounters with Grizzlies that took 4, 5 or 6 shots to slow them down and more to stop them they too adopted the Indian’s wisdom and gave the bears a wide berth. With huge canines and sharp six-inch claws, Grizzlies are a force to be reckoned with. Grizzlies are magnificent animals with the females weighing between 300-400 lbs and males 400-800 lbs with some males under a high protein diet tipping the scales at 1500 lbs. The coat color varies somewhat, generally blond to darker brown or blackish, with very long guard hairs over a thick fur. Though classified as carnivores, the bulk of their diet often consist of fruits and berries, seeds and insects. In coastal areas, they feast on high protein salmon during the annual runs upstream. The Grizzly was almost entirely exterminated from the lower 48 States but has made somewhat of a comeback under the protection of the Endangered Species Act. The U.S. Fish & Wildlife Service in 2006 proposed to “delist” the Grizzly as a threatened and protected species under mounting pressure as the bears expanded into their traditional range overlapping livestock areas. However, in 2009 U.S. District Court reinstated protection due to te decline of the Whitebark Pine tree since pine nuts are a staple source of food for the bears. Estimates vary but the Grizzly population in the lower 48 appears to be in the range of 1200 to 1500 animals. In British Columbia, Canada the population is far higher likely due to the more expansive wilderness areas. On a recent trip to northern Montana, tracking through Glacier National Park south to the Beartooth Range and into Yellowstone, we were looking for bears to photograph but saw only signs of their passage. Then early one evening our luck changed just south of Yellowstone in the Shoshone National Forest. 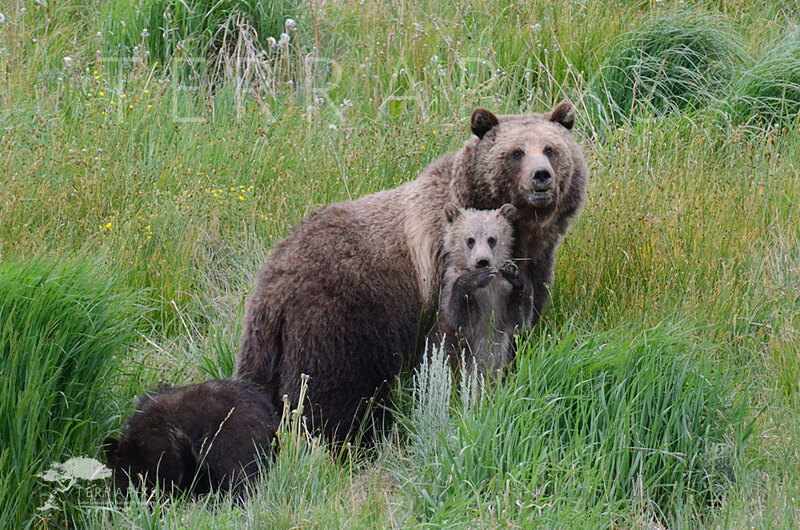 There, along the roadside in plain sight was a beautiful Grizzly Sow and her two cubs born in early spring in her den.. Grizzly moms are extremely protective so these pictures were taken with a 600 mm lens a safe distance away. For some time we watched the antics of the cubs as their mother rooted for grubs and insects. Every now and then she would look up to be sure they were safe. It was a real treat that I hope all you readers get to enjoy someday, but be sure to stay a safe distance away. Life is short-get outside and bask in the wonders of nature!